I’d heard good things about Jade Garden, most notably in a blog post from my friend Nicola which focussed on some of the weird and wonderful items that lurk in the darker recesses of the menu. On a dreich Tuesday, I went to check it out. The place is strongly geared towards takeaway, but there are a few plastic tableclothed tables for sit-in customers. I took a seat at the table next to the chest freezer. 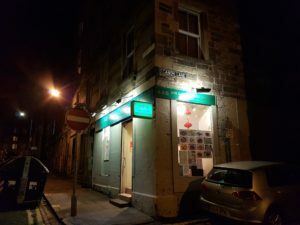 There are a few menus to choose from – a couple aimed at Chinese customers with a selection of chef’s specials, and one more obviously for the takeaway customers. 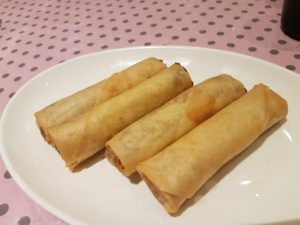 I attempted to blend the two choosing duck spring rolls to start then – on recommendation from the friendly owner – the fish fillets with bean curd. I added some egg fried rice, too. The spring rolls soon arrived and were among the best I’ve had in the city. The duck meat was deeply flavourful and the casings beautifully crisp. The main course was really good, too. 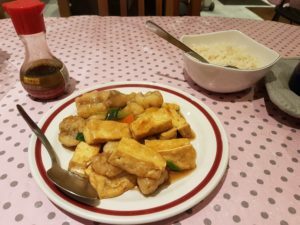 Generous pieces of lightly floured monkfish were meatily good and the tofu was lightly crisp. I was impressed. So overall, the Jade Garden is one of the better Chinese places I’ve visited in the city. I’d be keen to try some more of the speciality dishes on a future visit. Next time you’re thinking that Chinese food is what you need, consider a trip to Jade Garden.